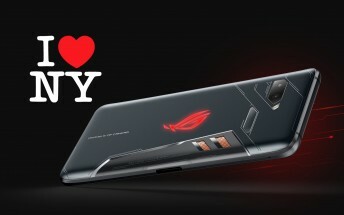 Asus is bringing the ROG Phone to New York on October 18. To be clear, this is the original ROG phone, the one that was announced back in June (four months ago!) and has been in limbo ever since. The tweet is not the most detailed, it just says “details to follow”. Still, the timing does tie in with the late-October shipping date we got off a GearBest listing. However, we’ve learned not to trust non-Asus sources on the ROG phone related matters after the supposed Indian launch in September and the Finnish pre-orders. Asus has not named a price for its gaming powerhouse yet, (clearly) not a launch date either. So, those may be the “details” that will be revealed at the event. Dare we even hope for day-one availability? Anyway, the Asus ROG phone has been on the company’s US regional site for a while now. And despite its tardiness, the overclocked Snapdragon 845 should still top benchmark charts (especially when it comes to sustained performance thanks to X Mode and advanced cooling).